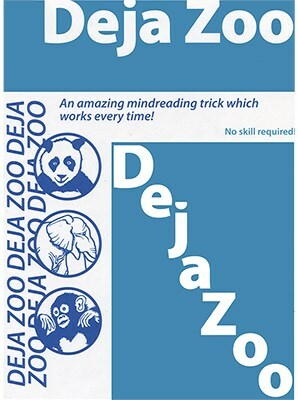 You show the audience a set of various zoo animals on flash cards. Two spectators stand up in the audience and think of any one of the animals as you show them all of the cards. Picking up a blank card and a felt-tip marker, you attempt to read the minds of the spectators and draw a quick sketch. You place your predictions on a card stand, and for the first time, the spectators call out the animals they selected. You place their selections on the stand next to your sketches, and when the stand is turned around, you have correctly guessed their choices! Side of Flash Cards: 4.5" x 7"